Credit Thanks to Le_Diamond_Creeper and bluesonicx for posing in the photos! I hate guys in diamond armor, because they are bullies and kill weaker players! im a Settler and a Creative Builder. Chatterbox, The Amazing Builder, Settler. I am a griefer, exploerer, and settler. I have a cycle of life. First, I am the explorer, hunting for the perfect spot to live in, usually by myself but sometimes in a town. Then, I am the builder, manifesting the perfect home for me to settle down in. Then, I am the settler, living in this home I have created. Then, I am the girl in diamond armor, beating the crap out of any griefer that even thinks of griefing my area. When I am in a town, I am a guard. BTW, when I'm an explorer, I get chased by the guy in diamond armor because I usually have diamonds on hand. You forgot miner, guard, and sniper. (Update! I am an Extreme Server Hopper. I have like, 29 servers in my server list, and I'll hop around them looking for something to do. 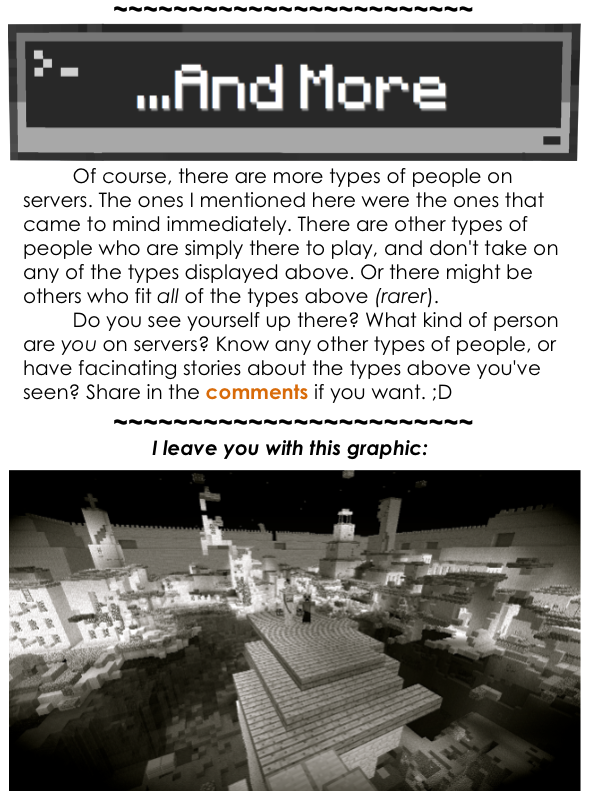 I frequent Okicraft(for survival), Mineplex(for minigames), and LOTG Craft(for faction survival). Oh and that n00b that gets chased by That Guy In Diamond Armor. 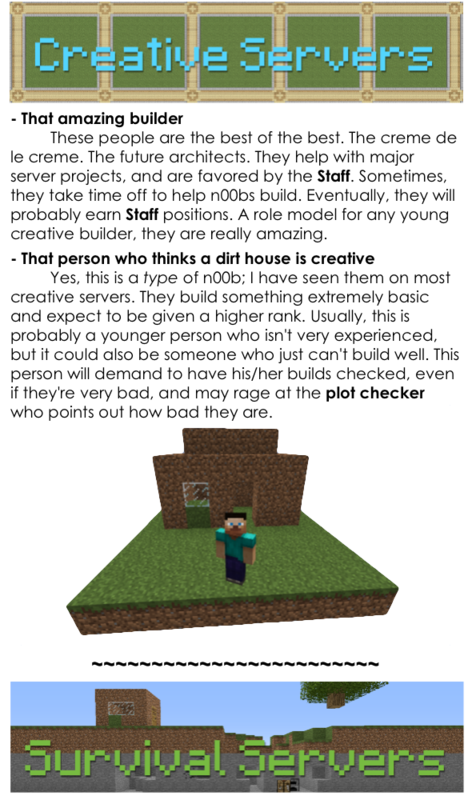 Once `that guy with diamond armor` came to my and my friend`s house, killed us, took the diamonds, gold, emeralds and iron, burned the tree next to the house and filled the house with lava. I`m usually the devoted one. I'm probably an explorer and a chatterbox. Hope you don't mind if I ask... what is the font that you used? The builders - These are the people who build incredible towns and houses. They are like the the settlers as they mostly fall to ruin from the infamous raiders. 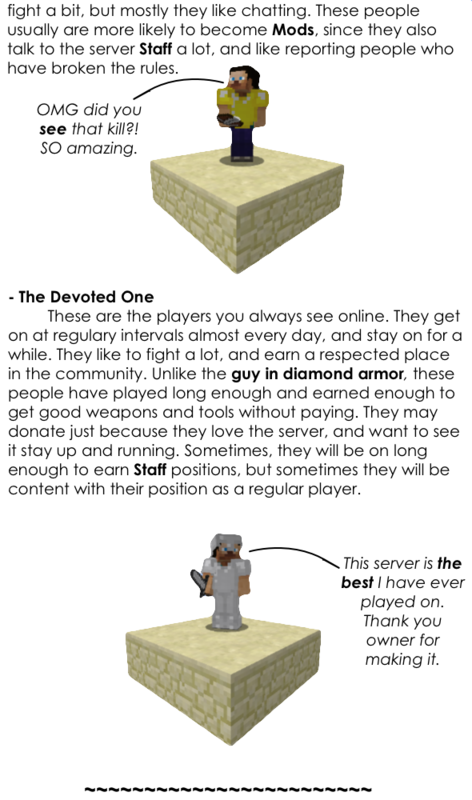 Hope you like these ideas, if not, maybe you can add a few of them to the survival server section. I think I am -The amazing builder, -The devoted one and -Settler in the same time. I love building, pvp'ing, details, roleplaying, and often I play survival. 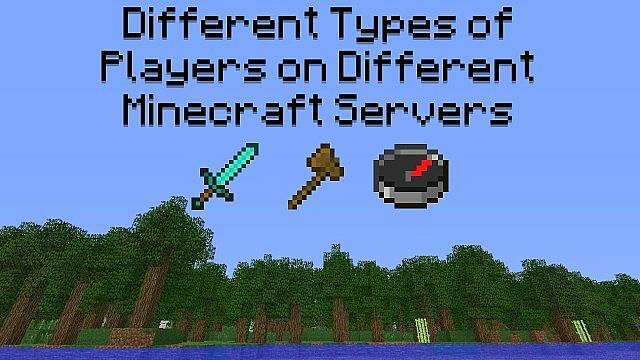 You forgot Hackers, what is lots of in pvp, and some X-Rayers in survival. I personally think that I am a mixture of the "Settler" and the "Explorer" type, because I love to see the world around my town/home, but I never go too far. It's just that feeling that you don't want to leave this place you have "lived" in for the last couple of days, months or even years(in which case you should go outside). The ONLY reason I go out is to gather resources, like wood, stone, ect. That's more of a builder type, but an adventurous builder type. 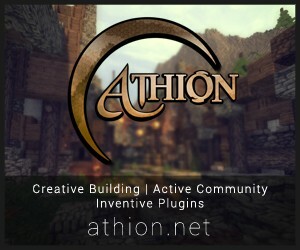 Is this the Assassin's Creed server ? 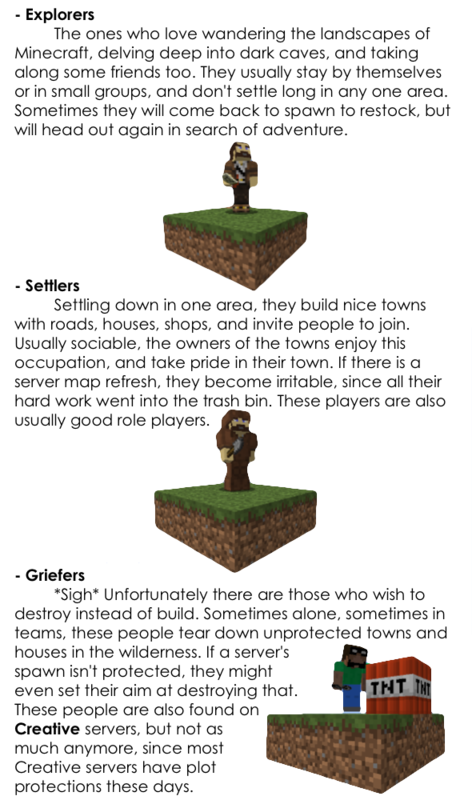 The last image is from the Assassin's Creep adventure map. I see myself as a devoted settler. I dont really like pvp, mostly cus of the people ive pvpd have been hackers who got banned the next day. I also see MULTIPLAYER as something that should bring us together. Sure you might not know all these people in real life, but dose that stop you from forming friendships? 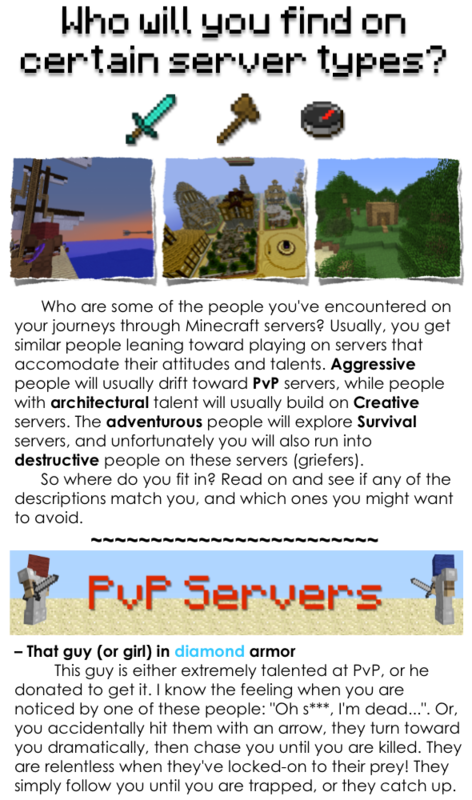 Ive made tuns of friends via minecraft and thats cus i dont pvp. Thanks MrFredrik. ;) Glad you liked it. I think of myself as a creative builder, and a devoted one. I agree, I have seen some builds like the dirt house before, and have banned some for raging the chat a few times. I don't go on Creative servers much, but in the past I did see this type of thing. Especially in Plot Worlds, it seems. Create work,you made this post worth! A diamond and a favorite,you made a excelent work helping players identify the types of players,some bads some goods,I hope you keep doing this great job! I'm a raider. Not listed there, but it's a PvP class, one who sneaks about away from the action looking for great bases to steal from and destroy. I bet a group of them would storm a village, kill everyone, loot it, take the decorations and burn it to the ground. 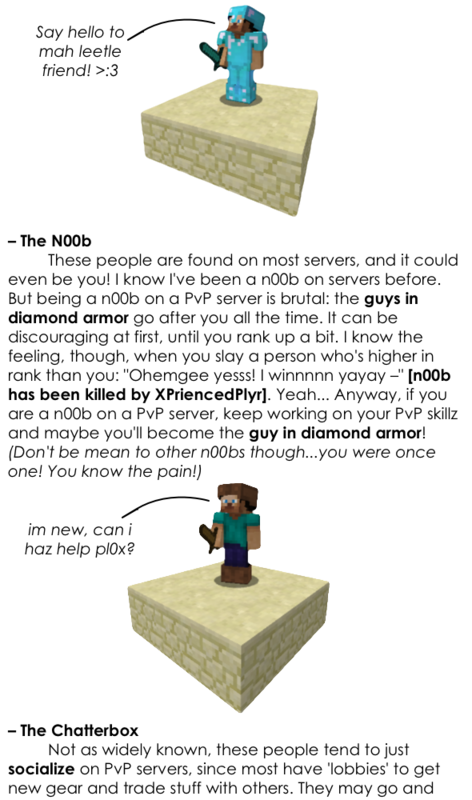 I'm a Griefer / Explorer. I stopped being a Griefer because I got a perm ban on 2 servers. Serves me right. I think Another type of Player is A Server Hopper, im not one my self but i see alot of them. I Am a hybrid. I Want to build but I aint that GREAT but I can still be pretty amazing stuff. I Pvp sometimes but dont like loosing items. I Am probably over all the chatty one. I Get staff alot and talk to people to. I Am also dedicated so I am a Bedattyeruiler. I find myself to be a little of all of these. Except maybe That Amazing Builder or the PvP guy. One of the best blogs I've ever seen, Awesome images! Please.. Can someone give my blogs a look at, a few are really popular! O_O my computer did a triple-post of the same comment. What. Am. I?